Bacteria that cause many hospital-associated infections are ready to quickly share genes that allow them to resist powerful antibiotics. The illustration, based on electron micrographs and created by the Centers for Disease Control and Prevention, shows one of these antibiotic-resistant bacteria. The study shows that two genes that confer resistance against a particularly strong class of antibiotics can be shared easily among a family of bacteria responsible for a significant portion of hospital-associated infections. Drug-resistant germs in the same family of bacteria recently infected several patients at two Los Angeles hospitals. The infections have been linked to medical scopes believed to have been contaminated with bacteria that can resist carbapenems, potent antibiotics that are supposed to be used only in gravely ill patients or those infected by resistant bacteria. Dantas and other experts recommend strictly limiting the usage of carbapenems to cases in which no other treatments can help. The study, conducted by researchers at Washington University, Barnes-Jewish Hospital and the National University of Sciences and Technology in Pakistan, is available online in Emerging Infectious Diseases. The researchers studied a family of bacteria called Enterobacteriaceae, which includes E. coli, Klebsiella pneumoniae and Enterobacter. Some strains of these bacteria do not cause illness and can help keep the body healthy. But in people with weakened immune systems, infections with carbapenem-resistant versions of these bacteria can be deadly. 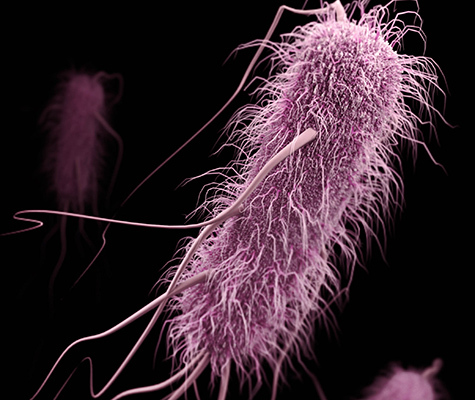 The Centers for Disease Control and Prevention named carbapenem-resistant Enterobacteriaceae as one of the three most urgent threats among emerging forms of antibiotic-resistant disease. Studies have shown the fatality rate for these infections is above 50 percent in patients with weakened immune systems. Two genes are primarily responsible for carbapenem-resistant versions of these disease-causing bacteria. One gene, KPC, was detected in New York in 2001 and quickly spread around most of the world, with the exception of India, Pakistan and other South Asian countries. This gene was present in the bacteria that recently contaminated medical equipment in a Los Angeles hospital where two patients died. A second carbapenem resistance gene, NDM-1, was identified in 2006 in New Delhi, India. It was soon detected throughout South Asia, and most patients infected by bacteria with NDM-1 have had an epidemiological link to South Asian countries. Dantas and his collaborators were curious about why the two resistance genes seemed to be geographically exclusive. For the study, they compared the genomes of carbapenem-resistant bacteria isolated in the United States with those of carbapenem-resistant bacteria isolated in Pakistan. Based on the apparent geographic exclusivity of the two resistance genes, the scientists expected to find that bacteria from the two regions were genetically different. Such differences could explain why the two resistance genes weren’t intermingling. But the researchers’ results showed otherwise. The bacteria’s high genetic similarity suggests that the antibiotic resistance genes could be shared easily between bacteria from the two geographic regions. The researchers also sequenced a special portion of bacterial genetic material called plasmids. Most of a bacteria’s DNA is found in its chromosome, but bacteria also have many extra, smaller and circular bits of DNA known as plasmids that easily can pass from one bacterial strain to another. A plasmid is like a bacterial gene delivery truck; it is the primary way antibiotic resistance genes spread between bacteria. The researchers identified a few key instances in which the plasmids carrying NDM-1 or KPC were nearly identical, meaning they easily could facilitate the spread of antibiotic resistance between disease-causing bacteria found in the United States and South Asia. Recent evidence suggests that this intermingling already may be happening in parts of China. This research was supported by the National Institutes of Health (NIH) Director’s New Innovator Award, the National Institute of Diabetes and Digestive and Kidney Diseases, and the National Institute of General Medical Sciences, grant numbers DP2DK098089 and R01GM099538. Pesesky MW, Hussain T, Wallace M, Wang B, Andleeb S, Burnham C-AD, Dantas G. KPC and NDM-1 are harbored by related Enterobacteriaceae strains and plasmid backbones form distinct geographies. Emerging Infectious Diseases, June 2015; http://dx.doi.org/10.3201/eid2106.141504.